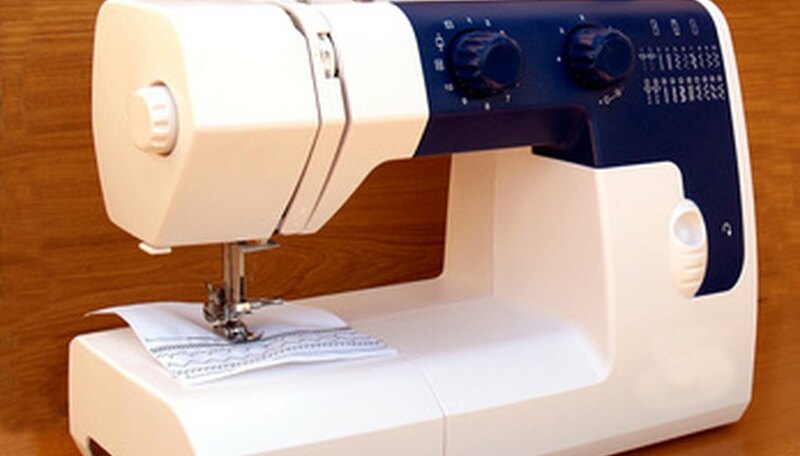 The Singer Company has made high quality sewing machines since 1851, and continue to offer a range of machines geared toward the home sewer. (See References 1) With a variety of options and price ranges in their easy-to-use machines, they are still very popular. All Singer sewing machines have an automatic bobbin winder, which is both fun and functional. Winding a bobbin is simple and quick, and allows you to start sewing right away. Turn your machine off and remove the sewing machine needle. Turn the needle clamp screw, located to the right of the needle clamp, toward you to loosen it. Pull the needle out carefully and set it aside. Raise the presser foot by pushing up the lever located behind the needle bar. Place a spool of thread on the spool pin, pulling the tail of the thread away from you so it hangs over the back of the machine. Place a spool cap on top of the spool of thread to keep it in place and prevent the thread from tangling. Pull the thread tail to the left toward the thread guide post, located on the rear left side on top of the machine. Secure the thread in the slot located in the thread guide post, making sure the thread goes from right to left. Pull the thread from the left side of the thread guide post to the right side of the bobbin winder tension disc, located on the front left side on top of the machine, directly in front of the thread guide post. Wrap the thread completely around the tension disk, making sure the thread is located securely in the disk slot and comes out the right side of the tension disc. Place the thread in your left hand and the empty bobbin in your right hand. Push the thread from the inner rim of the bobbin up through the small hole located at the top. Pull the thread up, leaving a tail of at least 8 inches. Snap the bobbin into place on the bobbin spindle, located on the front right corner on top of your machine. Push the spindle over to the right until it clicks into place. Hold the bobbin thread tail straight up, away from the bobbin. Turn on your machine. Press the controller foot slowly until the bobbin starts winding. Gradually increase the speed. The bobbin will automatically stop winding when it is full. Trim both the bobbin thread tail on the top of the bobbin and the thread leading to the spool of thread. Push the bobbin spindle to the left and remove your bobbin.